Floral arranging makes use of your fresh cut flowers and adds decorative accent to your home environment and as table centerpieces. There are 10 basic types of floral arrangements, making designing one a creative task to complete. Knowing about some of the different types of floral arrangements gives you the ability to create some of your own floral pieces. It also gives you the opportunity to create your own signature arrangements after learning about the basics. The dome floral arrangement allows for a 360-degree view of the arranged flowers and foliage. This is achieved by using a base such as a basket, fishbowl or other similar receptacle and by arranging flowers of the same size and length to create a dome with the blossoms. One of the most basic arrangement types, the dome proves to be an ideal arrangement for beginners to complete. 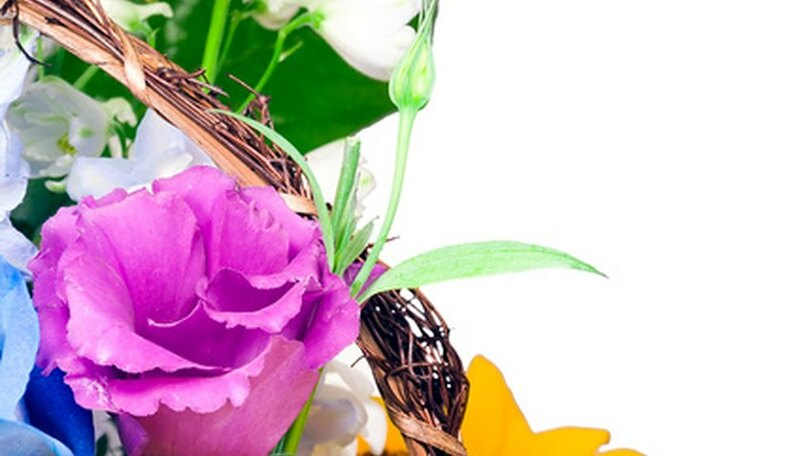 Oval flower arrangements are similar to dome arrangements in how they are arranged. The difference is that the formation begins wide and tapers as it goes upward, giving the arrangement an oval shape. 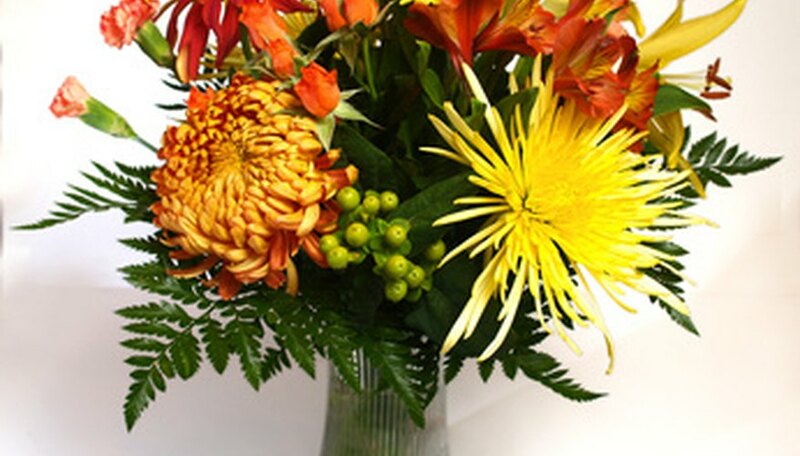 To achieve this effect, the stems of the flowers are cut and the tallest stemmed flowers are placed in the center of the arrangement. An easy-to-learn arrangement for beginners, the oval floral arrangement makes use of some of your grandest blossoms. Triangular arrangements are similar to oval arrangements in that the way the flowers taper is the same. However, the difference is that the triangular, or equilateral, arrangement is much more pronounced in shape. The look is achieved by creating a simple oval arrangement while spacing the flowers apart more widely. Tall, grand blossoms accent the very center of the arrangement to create the tapered triangular look to the bouquet. Much as the name suggests, vertical arrangements are tall, upright and slim in width. One of the most basic of arrangements, the vertical arrangement allows you to make use of flowers with tall, sturdy stem structures such as roses, lilies and orchids. Vertical floral arrangements also leave plenty of room for your imagination to take control by adding decorative embellishments to the simplistic and minimalist design. For example, a thin, tall glass vase containing a single long-stemmed rose becomes a decorative statement when a couple of shoots of pampas grass are inserted at either side of the rose. 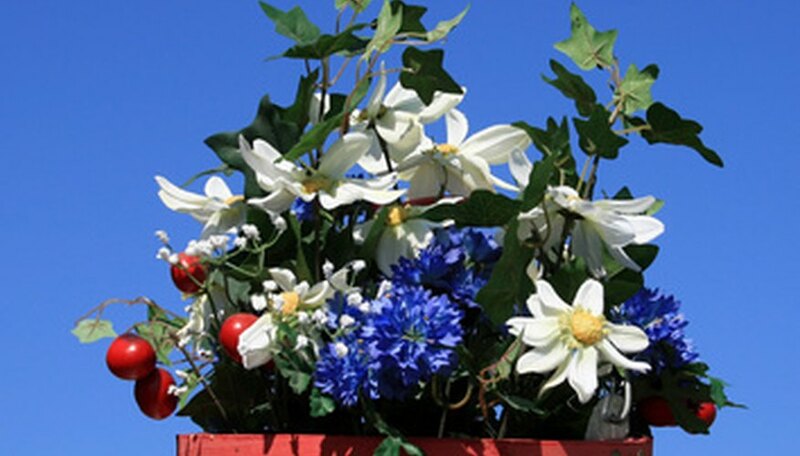 Vertical floral arrangements can also be quite intricate with the use of florist wire and a foam base. This allows for the "sculpting" of a straight an upright design with the flowers.